There's not a whole lot that the Nokia Lumia 620 does wrong. As an all-round, jack of all trades budget handset it does a great job. We'd love it if the screen was slightly bigger or it had a little bit more RAM, but for the price we can't really complain. The Nokia Lumia 620 is Nokia's third foray into Windows Phone 8 territory, but while the previous two - the Nokia Lumia 820 and the Nokia Lumia 920 - were both fairly high end affairs, this is a decidedly budget handset. Really its closest competitor is the HTC Windows Phone 8S, since the two phones have pretty similar specs. They both have a dual-core 1GHz processor, 512MB of RAM, a 5 megapixel camera with 720p video and a 480 x 800 resolution display. The Nokia Lumia 620 has a fairly small 3.8-inch screen while the HTC Windows Phone 8S has a marginally bigger 4-inch one, but on the other hand the Nokia Lumia 620 has 8GB of internal storage while the HTC Windows Phone 8S only has 4GB. Essentially they're pretty similar on paper. The big difference is the price, since the Nokia Lumia 620 is being sold for a temptingly low £150 (around AU$225/US$235) if you get it on Pay As You Go in the UK - free on monthly UK contracts from £17 (around AU$26/US$27) per month. Or it's £229.99/AU$299 (around US$360) SIM-free. The HTC Windows Phone 8S, meanwhile, will cost you at least £200 (around AU$300/US$313). That alone is a huge selling point, and for entry-level buyers who want to try Windows Phone 8 it's positioned itself as pretty much the only choice, that is assuming the performance can match the HTC Windows Phone 8S. 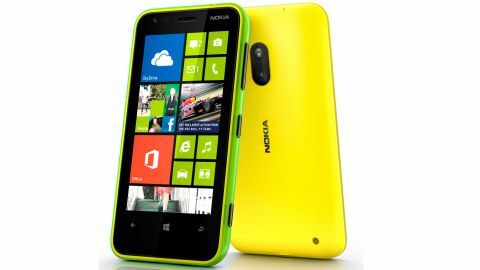 Following Nokia's recent trend, the Lumia 620 is colourful - very, very colourful. There are loads of colour options for the back of the phone, but whether you plump for a yellow, red, blue, green or something else altogether you can be sure it'll be bright. You can also easily swap between covers, so if you want you can have a different colour every day of the week, or even change it multiple times a day just to confuse everyone. As well as looking colourful, the Nokia Lumia 620 also looks kind of cheap. With dimensions of 115.4 x 61.1 x 11mm (4.5 x 2.4 x 0.4 inches) it's small and chunky. It's also slightly heavier than we expected for a handset of its size, coming in at 127g (4.48oz) compared to 113g (3.99oz) for the slightly larger HTC 8S. It feels decent enough in the hand, the curved edges of the plastic cover are comfortable to hold and because the cover is both quite solid and easily replaceable there's less fear of dropping it than there is with some other handsets, though the screen is still at risk. The front of the Nokia Lumia 620 is mostly taken up by the 480 x 800 screen, as you'd expect. At 3.8 inches it's certainly not the biggest we've seen, but it's a decent enough size for a budget handset. It's got a fairly reasonable pixel density of 246 ppi too, which while not as sharp as most high-end handsets is still good enough to produce fairly crisp images. Above the screen there's the earpiece in the centre, the front-facing 0.3 megapixel camera to the left of it and the Nokia logo to the right. Below the screen there's a slightly larger space with soft touch buttons for 'Start', 'Back' and 'Search'. The back of the Nokia Lumia 620 is fairly plain. The bulk of it is just a mass of bright colour from whatever back you've got on it, but there are a few features. Towards the top there's the main 5 megapixel camera, capable of shooting 720p video. In the centre there's another small Nokia logo, and at the bottom-right there's a loud speaker. On the top edge you'll find a microphone on the left and a 3.5mm headphone port on the right. The bottom edge has a micro USB port in the centre for charging the phone or connecting it to a computer, while just to the right of that there's another microphone. The left edge of the Nokia Lumia 620 has absolutely no ports or buttons on it, while the right edge contains all three of the handset's physical buttons, specifically a volume rocker at the top, the power/lock button in the middle and a camera button at the bottom. The positioning is great, with both the power and volume buttons easily accessible without getting in the way, while the camera button is slightly more out of the way but still perfectly useable when you need it. The back cover can be pulled straight off, making it easy to change. Underneath it you'll find the 1300mAh battery, while under that there's the microSIM slot. 1300mAh is a slightly worrying battery size, particularly considering the similarly specced HTC Windows Phone 8S has a 1700mAh battery and still only has a mediocre battery life. Nokia claims its battery is capable of up to 14 hours and 40 minutes talk time, 331 hours on standby or 61 hours of music, which isn't bad if true, though notably it doesn't give an estimate for watching videos or doing other things that require the screen, and these are generally the biggest drain. There's also a microSD card slot under the back cover. It supports cards of up to 64GB and is all but essential given that there's just 8GB of onboard storage. All in all it comes across as a good little handset, particularly for the price. It seems like a phone that might be especially good for children, given its bright colours, low price tag and robust, changeable back cover, but really it looks like a tempting option for anyone who wants to try out Windows Phone 8 for less than £200.